Dr. Marshall’s research is focused on characterizing turbulent flow transport in fires and flames using advanced diagnostics and models. Current flows of interest include unconfined and bounded fire plumes and fire suppression sprays. Dr. Marshall is applying scale-modeling principles to the plume dispersion problem in his DOJ sponsored research to develop small-scale test methods for fire investigation and forensic analysis. 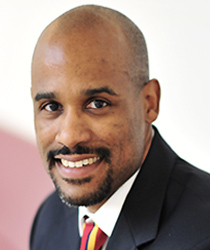 As part of his NSF CAREER Award and research sponsored by FM Global, Dr. Marshall is developing state-of-the art experimental methods and modeling techniques to analyze sprinkler discharge characteristics. Dr. Marshall is also very active in propulsion research. Currently he is performing an experimental investigation to characterize near-wall mixing and heat transfer along film cooled propulsion surfaces in support of the NASA Moon-Mars Crew Exploration Vehicle development. He is also characterizing atomization in fuel injection sprays as part of his NSF CAREER research. Additional information about Prof. Marshall, his research team, and their activities is provided below. In addition to his research activities, Dr. Marshall directs the Fire Testing and Evaluation Center (FireTEC) at University of Maryland. This center performs a wide variety of small and medium scale testing to support clients with interests ranging from fire investigation to product development and evaluation. Additional information about the FireTEC mission, labs, capabilities and activities is provided below. The general objective of this project is to provide a fundamental understanding of the efficiency of film cooling used for thermal protection of the components and surfaces in aircraft engine combustion chambers. With approximately one-third of the total airflow being used to cool the combustor liner and turbine blades, the effective use of this coolant air is of critical importance in efficient engine design. Film cooling involves the injection of a thin fluid film that buffers critical surfaces from the hot by-products of combustion. Film cooling involves the interaction of two highly turbulent, shearing, boundary layer flows in the vicinity of strong pressure gradients and heat transfer, making their measurement and prediction extremely challenging. However the accurate measurement and simulation of this flow is what generates detailed understanding and allows for effective flow design. 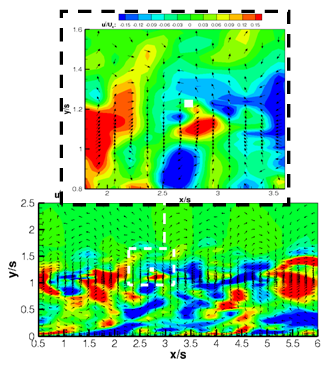 The specific objective of this work is to use detailed flow velocity and thermal information from representative film cooling configurations to evaluate the ability of CFD (Computational Fluid Dynamics), in both LES (large eddy simulation) and RANS (Reynolds-averaged Navier-Stokes) frameworks, to capture turbulent mixing and heat transfer dynamics. the top insert highlights a particular turbulent structure. Loci-CHEM, a NASA-based, compressible flow, RANS CFD solver, and les3d-mp, an in-house, incompressible flow (low Mach number), LES/RANS CFD solver, are used to simulate tangentially-injected, slot film cooling experiments (performed at UMD). 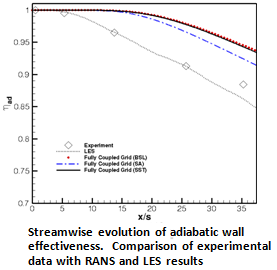 The joint experimental/computational study includes different cases ranging from subsonic to supersonic flow conditions, and featuring both adiabatic and non-adiabatic walls. The numerical study considers both fine-grained (wall-resolved) simulations and coarse-grained (wall-modeled) simulations. Ren, N., Blum, A. F., Zheng, Y. H., Do, C. and Marshall, A. W., “Quantifying the Initial Spray from Fire Sprinklers,” Fire Safety Science - Proceedings of the Ninth International Association of Fire Safety Science, IAFSS, Karlsruhe, Deutschland, Accepted, 2008. Wu, D., Guillemin, D., and Marshall, A. W., “A Modeling Basis for Predicting the Initial Sprinkler Spray,” Fire Safety Journal, Vol. 42, pp. 283-294, 2007. Yao, X., and Marshall, A. W., “Quantitative Salt-Water Modeling of Fire Induced Flows for Convective Heat Transfer Model Development,” ASME Journal of Heat Transfer, Vol. 129, pp. 1373-1383, 2007. Cruz, C. A. and Marshall, A. W., “Surface and Gas Phase Temperature Measurements Along a Film Cooled Wall”, AIAA Journal of Thermophysics and Heat Transfer, Vol. 21, pp. 181-189, 2007. Marshall, A. W., “Advances in Water-Based Fire Suppression Modeling: Evaluating Sprinkler Discharge Characteristics,” International Fire Sprinkler Conference, Copenhagen, Denmark, 2008. Marshall, A. W., “Quantitative Analysis of Fire Induced Convective Transport via the Salt-Water Analogy,” The Combustion Institute (UK Section), London, United Kingdom, 2005. Multiple FPE researchers recognized at international fire conference in Sweden. 5 Fire PhD students had their papers accepted into the 36th International Symposium on Combustion in Seoul. Cyber Physical System development was supported by the Chief Donald J. Burns Memorial Research Grant. Ph.D. candidate recognized for excellence in research and education. Program prepares graduate students for a career in academia. Presentations part of Mpact Week's Multi-hazard Resilience session. Marshall and FPE undergraduates produce three videos for free distribution. Faculty members elected to leadership roles; research image wins award. The grant is grant on the Quantification of Green Building Features on Firefighter Safety. The Dept. of Fire Protection Engineering will be well represented at the Austin, TX conference. Fire protection engineering professor and colleagues to quantify fire-spray interactions, form company. NSF funding for research to improve spray technology, creation of x-ray center for nano research. Profs. Marshall and Trouve to contribute to $7.8M/year research project, 20 universities involved. Martins, Yu, Aranda-Espinoza and Marshall selected for 2007 grants.